Our picks for the best ways to begin a healthier, greener life. easy enjoyable changes. Just substitute safe options for familiar habits. Just toss in the dryer like a dryer sheet, and use again and again. Standard disposable dryer sheets are filled with toxic ingredients that can pollute your air and irritate skin. Dryer balls decrease drying time and soften clothes naturally. 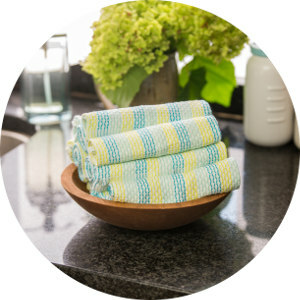 Wipe counters and spills with Swedish Dishcloths. Each one absorbs 15 times its own weight and lasts 9-12 months. Synthetic sponges and paper towels create lots of landfill waste. Swedish Dishcloths can be reused and composted. 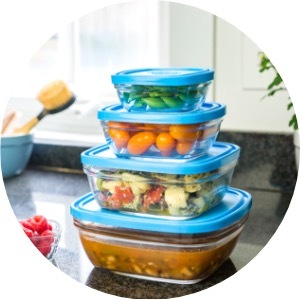 Store food in reusable tempered glass containers that can go into the microwave, freezer and dishwasher. Plastic tubs can leach toxins into your food and landfills. Tempered glass is 100% safe, strong and reusable, and can be recycled too. Stick to your normal routine but fight odor with a non-toxic deodorant. Your armpits do more than sweat. They soak up deodorant ingredients. Conventional options can contain concerning additives that clog pores, disrupt hormones and may even cause cancer. A non-toxic deodorant helps protect your health and keeps you smelling fresh. 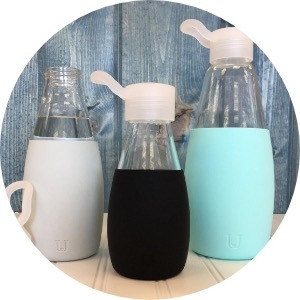 Simply refill a stylish reusable bottle instead of buying water in throw-away plastic bottles. Plastic water bottles leach toxins into our water and the environment, get trashed after one use, and take over 500 years to decompose. A non-toxic reusable water bottle keeps the yuck away from your body and plastic out of the landfill. We always say, "what goes on your body goes in your body"
are the most important healthy changes you can make. It’s simple: Big 3 products contact your body’s most delicate tissues, so any of their ingredients can easily enter your bloodstream. Conventional products often include concerning additives that researchers have linked to long term health problems. a happy gut and healthy hormones. 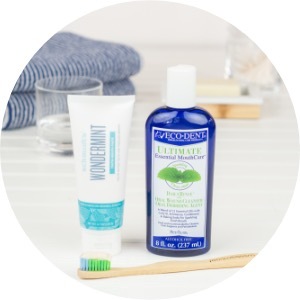 Simply brush and rinse with naturally safe toothpaste + rinse. Your mouth’s delicate membranes absorb ingredients. Conventional oral products contain overwhelming amounts of allergens, carcinogens and other questionable additives. Protect your health and please your dentist by choosing a non-toxic toothpaste + rinse that really works. Get real and let organic cotton support your cycle. Simply choose luxuriously safe organic cotton tampons and pads. During your period, tampons and pads stay in contact with some of your body’s most absorptive tissues. Conventional tampons and pads aren’t required to disclose ingredients but contain many toxic materials. 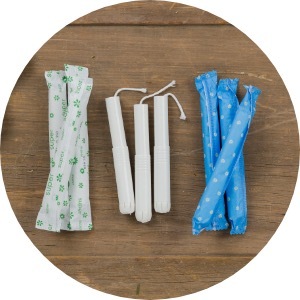 Help free your bloodstream from scary substances by using organic tampons + pads that really work. Take it to-go but make it earth-friendly. Choose our best options for safe and stylish lunch, commuting food, beverages, and shopping. Upgrade to a premium insulated travel tumbler. 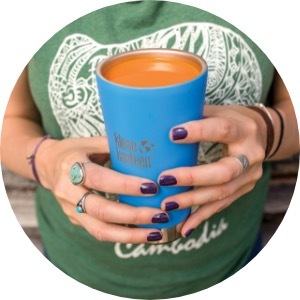 Replace disposable take-out cups with a durable insulated mug. Fill it up at home or at the café. Disposable paper cups create waste and contain toxin-leaching plastics. Non-toxic travel tumblers keep drinks hot, safe and stylish without the waste. Save the oceans one straw at a time. Skip plastic straws and sip from a sustainable straw. Americans use over 100 million straws every day. Many of these end up in the ocean and can kill marine life that mistake them for food. 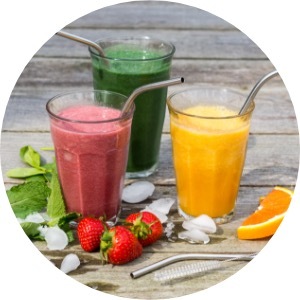 Sustainable straws are a simple switch with big impact. 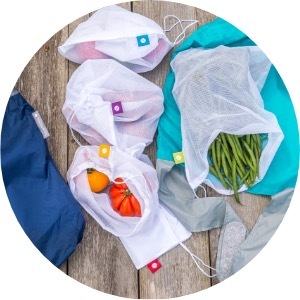 As you shop, put produce in handy mesh bags. At check-out, pack everything in durable nylon bags instead of using the store’s paper or plastic bags. Single-use plastic and paper grocery bags create loads of unnecessary trash. Plastic bags end up in trees, seas and landfills. Paper bags usually end up in landfills too. By bringing your own bags, you help reduce environmental waste. Pop your sandwiches and snacks into cute reusable baggies. Plastic bags leach toxins into food and create long-lasting waste. 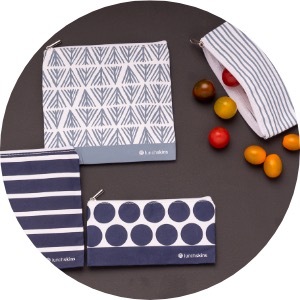 Non toxic reusable lunch baggies are an easy green way to keep food stylish and safe. Get cooking but keep it healthy! Try a fresh approach with our favorite non-toxic options. instead of plastic food wrap. 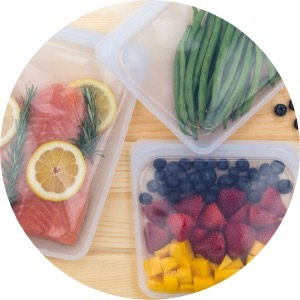 When you’re prepping lunch or storing leftovers, reach for Bee’s Wrap to pack sandwiches, store cheese, or cover bowls. Plastic wrap can contain BPA and other toxins that leach into foods, especially when they are hot or moist. 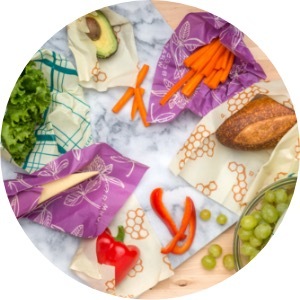 Bee’s Wrap is non-toxic and handmade from renewable resources in Vermont. 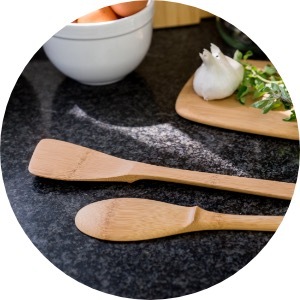 Replace plastic cooking utensils with safe bamboo and stainless steel. Disturbing health issues have been tied to materials found in everyday cooking utensils, such as Teflon BPA, aluminum, and other toxic chemicals. Non-toxic cooking tools help keep your food and body safe. 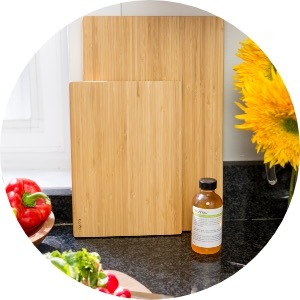 Replace your plastic and wooden boards with a sustainable bamboo cutting board. Plastic cutting boards harbor bacteria in cracks and nicks and end up in landfills. Many wooden boards are finished with petroleum-based mineral oil. Sustainable bamboo boards are responsibly harvested and 100% non-toxic. storage bags instead of zip-top plastic. Plastic bags leach toxins into food and create lots of landfill waste. Non-toxic platinum silicone bags actually inhibit bacterial growth, resist leaks and are endlessly reusable. 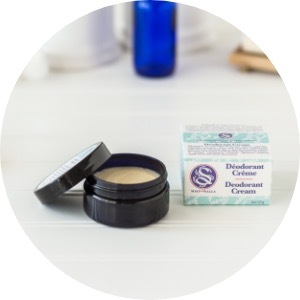 Avoid bad-dream ingredients by simply choosing toxin-free products. Block the sun with mineral-based sunscreen. 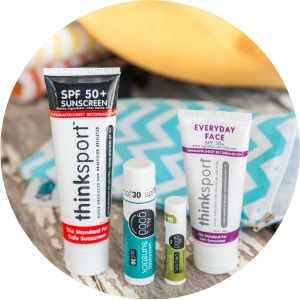 Apply safe sunscreen products to your body, face and lips. Conventional sunscreens contain questionable ingredients that absorb directly into your skin. Mineral-based natural sunscreens form a non-toxic barrier between your skin and the sun with ingredients that support good health. 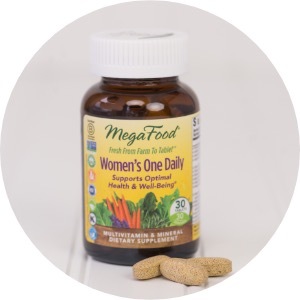 Give your family whole foods vitamins that exceed government standards. Many multivitamins contain icky ingredients like artificial colors, flavors, sweeteners and preservatives. Premium whole foods supplements nourish your family with organic and/or sustainable ingredients from small family farms. If you’re cleaning with it, you’re breathing it. Step into safe & green: the fresh way to clean your home. Make your home sparkle with non-toxic all-purpose spray. Mist anything that needs cleaning (kitchen counter, toilet, toys, whatever!) 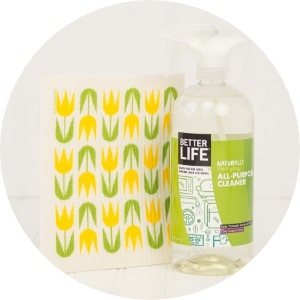 with a powerful natural spray, then wipe with a reusable cloth. Most conventional all-purpose cleaning sprays disperse chemicals that can be harmful to family, pets and our waterways. Tackle tough jobs with an all-natural cleaner that’s completely safe. Use powerful microfiber cloths to clean without synthetic chemicals. Attack grease and grime by spraying pure water from a reusable bottle and wiping with a microfiber cloth. 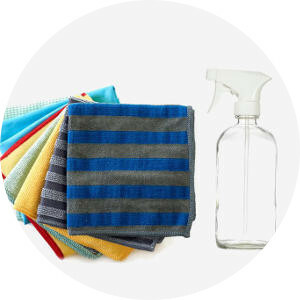 Conventional cleaners contain harsh chemicals and come in disposable plastic bottles. Single-use paper towels create lots of waste. Microfiber cloths are precision engineered (and scientifically proven) to remove 98% of bacteria, mold and dirt using only plain water. 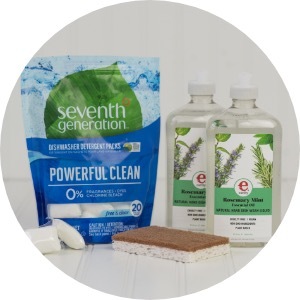 Green your dishes routine with eco-friendly soap, pods and scrubbers. Swap out conventional dishwashing soap, pods and scrubbers for green options. The ingredients in standard dishwashing soaps and pods pollute waterways and can trigger allergies. Disposable plastic sponges won’t decompose for centuries. Go easy on the planet and protect your health with plant-based cleaning products that get the job done. Choose natural laundry detergent for toxin-free textiles. Use natural laundry powder in your high efficiency or standard washing machine. Standard laundry detergents contain long lists of toxic, irritating, and/or secret ingredients that can trigger skin irritation and allergies. 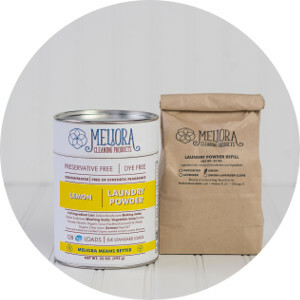 Natural laundry powder effectively cleans clothes with simple, safe ingredients. Roll over from paper towels to renewable organic cloth. Reach for a cotton dishcloth to clean counters, scrub sticky messes, or mop up surprise spills. Paper towels eat up precious wood resources and generate waste after just one use. 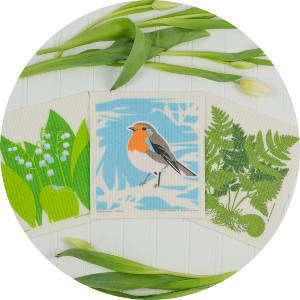 100% organic dish cloths work as well or better than paper, but can be washed and reused again and again. Sign up for the MightyFix and we'll send a surprise every month: one of our favorite healthy green changes delivered to your door with ideas and tips. Every month you'll discover a delightful new way to go green. 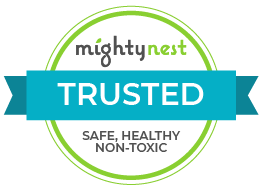 Plus you get full MightyNest membership benefits! Save up to 30% every day on the BEST healthy and green products. 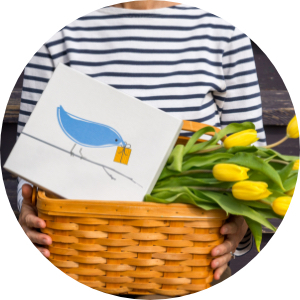 Add anything to your monthly box and it all ships free*. Have questions? Members can call, email, chat or set up a consultation.